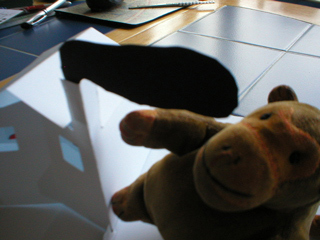 On a visit to The Lowry in Manchester, Mr Monkey saw an exhibition called Pop-Up - Around the World which was, unsurprisingly, about pop-up books. After he'd looked at examples of pop-up books depicting buildings from all over the world, he had the chance to make a pop-up of his own. He still wanted to look around the gallery, so he decided he'd have a go at home. 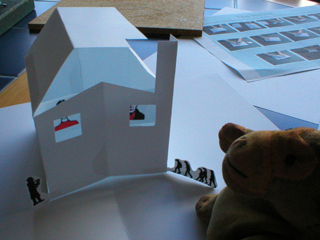 When he got home Mr Monkey went online to read about Pop-up at The Lowry website. 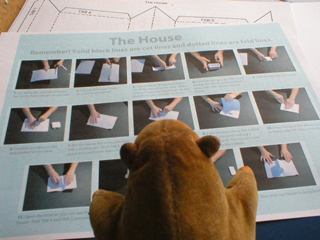 He downloaded the instructions and templates for making a simple house pop-up. He studied the instructions and waited for inspiration to strike him. 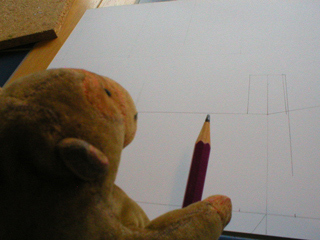 Mr Monkey decided that just using the Lowry's template would be far too simple, so he started drawing a similar but different building. His house was more of a mill, with a chimney and two big windows in the front wall. Next Mr Monkey got Mr Rik to carefully cut out the main piece for the building. 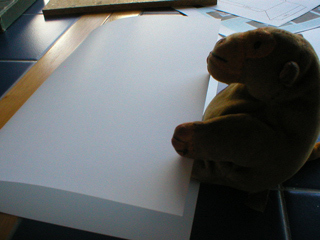 Mr Monkey hadn't forgotten to include tabs to smear glue onto during the construction of the building. 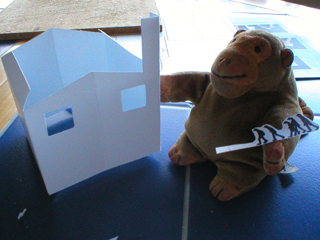 Mr Monkey began to fold up his building, taking care to put a crease in the middle of the end walls so that the building would fold up when Mr Monkey wanted it to. Then he made Mr Rik glue the the ends together, to turn the strip of card into a building of card. Mr Monkey didn't want to get glue on his paws, and Mr Rik's fingers are totally washable. 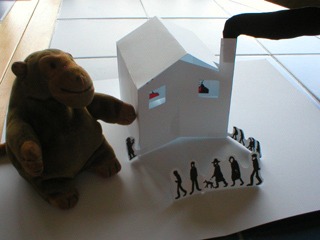 To liven the building up, Mr Monkey added some figures drawn sort of in the style of L.S. Lowry to the front of the building. On the right he put a number of people going home from work, and on the left he put a made-up figure that's supposed to be Lowry sketching. 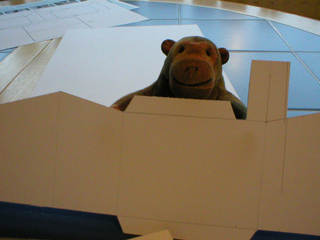 Mr Monkey added a cross panel between the side walls of his building. This was needed to hold up copies of two Lowry paintings that Mr Monkey had admired at the gallery, and that he intended to be visible through the windows on the front of the building. 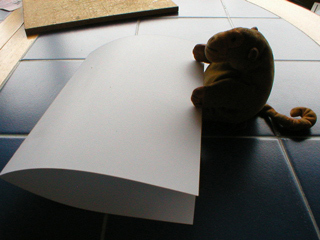 For a pop-up to pop up properly it needs to be folded up beforehand. 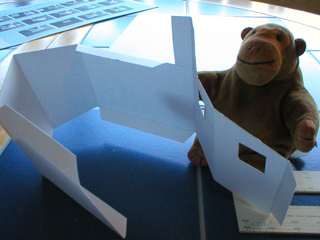 While Mr Rik skived with a cup of coffee, Mr Monkey folded an A4 sheet of card in half to provide a base for his squashable building. Mr Monkey made sure that Mr Rik glued the building onto the base in more or less exactly the right place. He opened and closed the base a couple of times to check that the pop-up worked. All that the building was missing was a roof, so Mr Monkey cut one out and let Mr Rik glue it to the tabs on top of the side walls. To liven up the foreground a little Mr Monkey drew some figures inspired by L.S. Lowry's industrial landscapes, folded them down the middle, and fitted them on the base. He made sure they were on the folding line so that they'd pop-up when the card was opened. 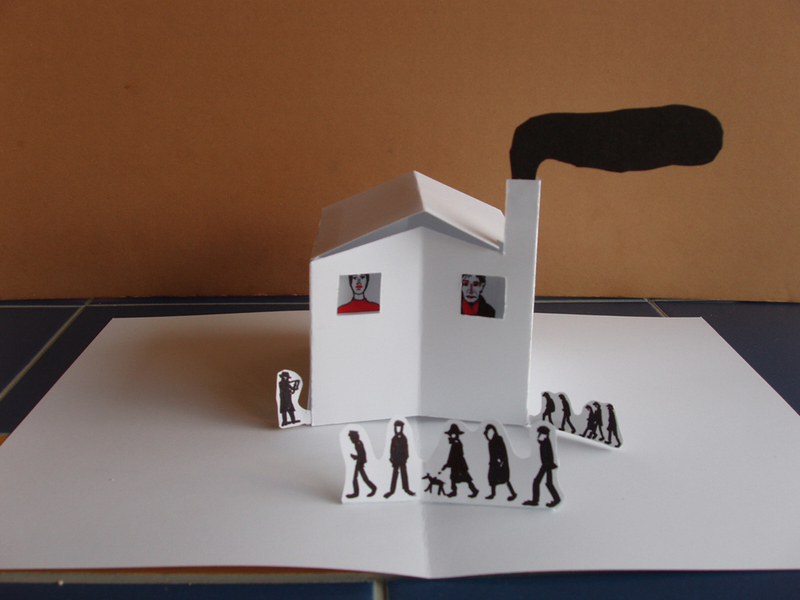 Mr Monkey realised that his mill should be polluting the air, so he cut a cloud of smoke from a piece of black card and fixed it to the front face of the chimney. He experimented with white smoke, but it didn't look at all right. 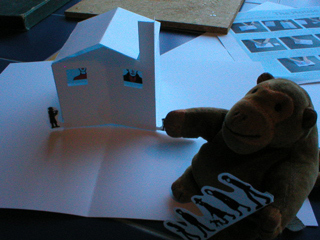 Mr Monkey decided his pop-up was finished. He folded the card up, but found it was rather eager to open. 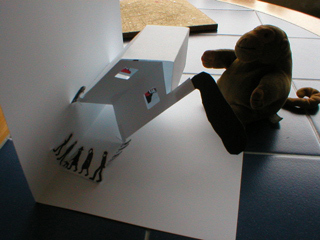 When Mr Monkey let go of the edge of the card the building did its best to open up. It didn't quite manage to open completely, because gravity or lack of energy or something stopped it half way. Mr Monkey gave the card a quick nudge, and opened it up fully. He admired it for a while before noticing that Mr Rik had given him the wrong measurements for the roof, which was a shame. Figures to the right of the building are based on figures from Coming From the Mill; foreground figures inspired by people in The Organ Grinder. The faces at the window are based (slightly more loosely than intended) on Portrait of Ann (1957) and Head of a Man (With Red Eyes) (1938). 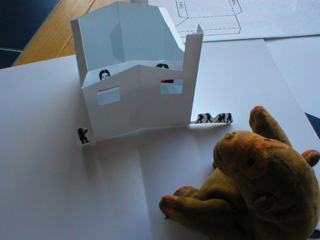 Mr Monkey (and Mr Rik, too) would like to thank The Lowry for changing his opinion of L.S. Lowry's work by displaying some of his seascapes and portraits as well as the industrial townscapes. Mr Monkey is still convinced that too many of Lowry's industrial workers wear oversized clown shoes, though.